Rio de Janeiro, Thursday August 18, 2016: The SKNOC has welcomed the official visit of St. Kitts & Nevis Deputy Prime Minister and Minister of Sports, the Hon.Shawn Richards, to Rio 2016, the Deputy PM’s first attendance at an Olympic Games. A welcome ceremony to mark Minister Richards arrival at the Olympic Village was held Wednesday, chaired by Leroy Greene, Chef de Mission and Assistant Secretary-General of the SKNOC,in the presence of members of the SKNOC and Olympic Team SKN. 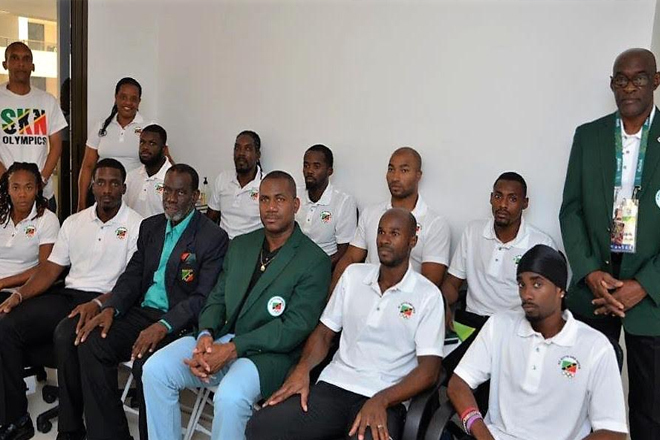 The official visit to Rio demonstrates Minister Richards’ personal, his Ministry’s and his government’s continuing support for athletes and sport in general, his arrival following a busy schedule in St. Kitts which successfully hosted the just concluded semi-finals and finals of the 2016 CPL T20 matches. Minister Richards spent time with each of the athletes in the Olympic Village, during their practice and preparation for their competitions as well as touring the Olympic training facility and being available for photographs with the team. He warmly commended and congratulated the athletes for having been selected to represent SKN on the largest stage in the world of sport. Minister Richards has also been offering his full encouragement to the athletes for their achievements so far during the athletic events, extending his own personal congratulations to Kim Collins for his super-human effort in the heats and semi-finals of the Men’s 100m. He also expressed his personal best wishes, and on behalf of the people and government of SKN, to the team, ahead of their Relays.